BNL’s Braydon Brown delivers a pitch. Brown worked 6 innings for the win as the Stars conquered North Harrison 12-6 on Friday afternoon. BEDFORD – Colton Brown made two brilliant defensive plays and one kick save for Bedford North Lawrence. The first two saved runs, the latter kickstarted an offensive outburst and a vital victory. He was just one of the key contributors as the Stars stopped North Harrison 12-6 on Friday afternoon. 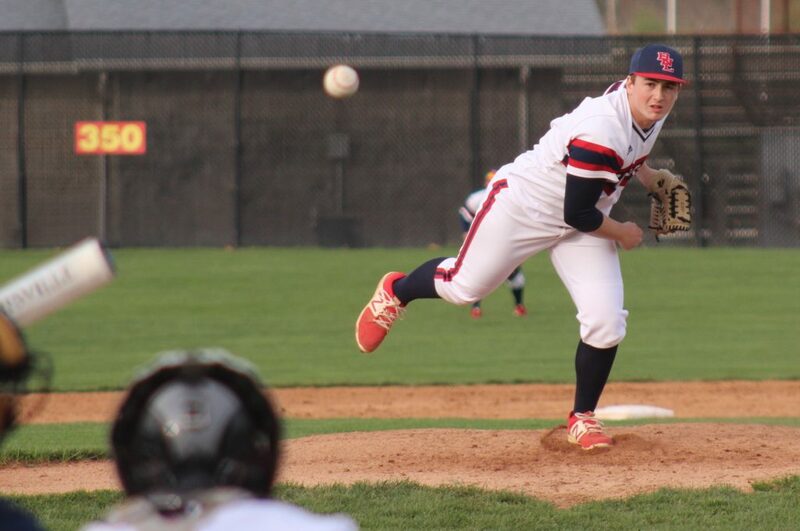 Ethan Baer was another, cracking 3 hits and driving in 5 runs, and Braydon Brown earned his first win with six solid innings. The Stars (4-6) ended a two-game skid, taking advantage of 11 walks (six of those later scored) for extra opportunities. None was more important, setting the tone for the offense, than Brown’s innocent at-bat in the second. 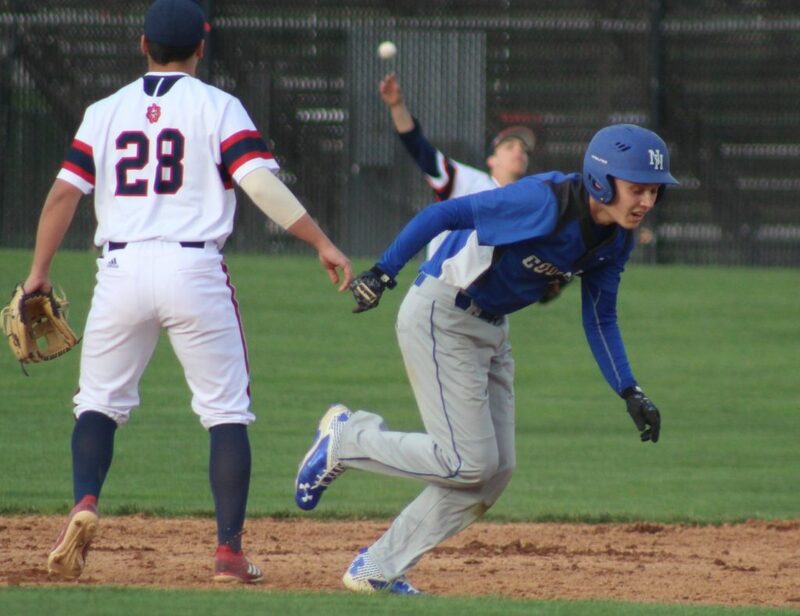 With two out and two on, North Harrison thought it had recorded the final out when Brown meekly tapped into a ground out. The Cougars left the field, with the score knotted at 1-1. 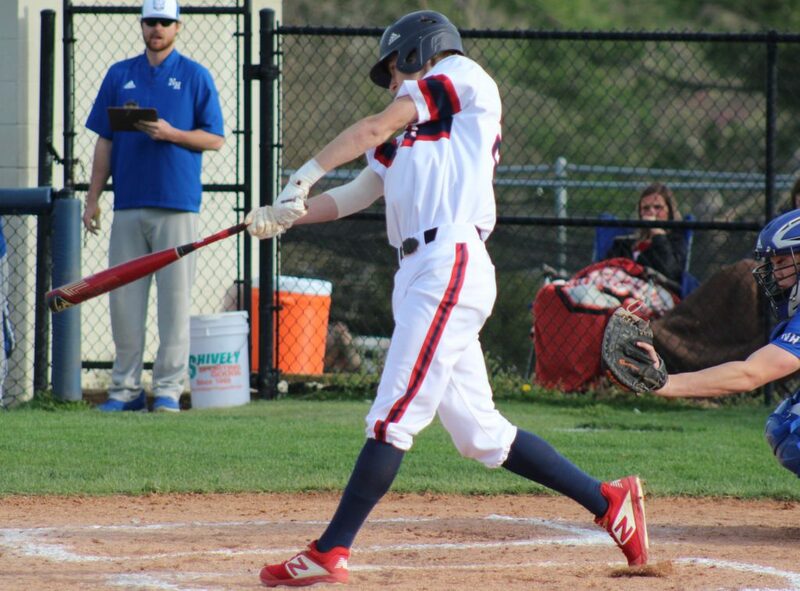 But BNL coach Jeff Callahan questioned whether the ball had glanced off Brown (after contact) while he was in the batter’s box, which constitutes a foul ball. The umpires conferred and agreed, sending the Cougars back on defense, and Brown returned to the plate. He walked to load the bases. BNL’s Ethan Baer cracks a bases-loaded double during the 4-run second inning. Baer cleared them, ripping a double to right-center as BNL took a 4-1 lead and never looked back. That was the launch point for the win. 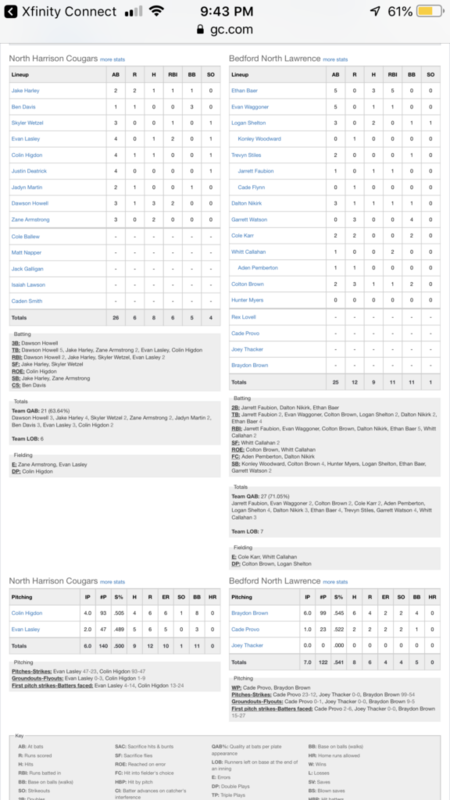 Baer later capped the BNL scoring with a two-run single during a 5-run sixth, and Whitt Callahan had two sacrifice flies as the Stars made the most of 9 hits. Patience was rewarded. BNL did damage on the pitches that actually crossed the plate. Most of the ones the Stars saw did not. Only half the 140 pitches from North Harrison hurlers Colin Higdon (0-1) and Evan Lasley were strikes. North Harrison’s Zane Armstrong starts to scramble back toward first base as BNL center fielder Colton Brown fires toward the base to complete a double play. The Stars added two runs in the fifth on Callahan’s second sac fly and a double steal executed by Brown and Baer. They capped the night in the sixth as Jarrett Faubion (RBI double to left), Dalton Nikirk (RBI double to left) and Baer (two-run single) came through with the clutch hits. Back to Brown. He turned a double play in the third, racing in quickly to snag a line drive off the bat of Jake Harley and firing to first to get Zane Armstrong (who had been running on the pitch). He then made a sensational diving catch in the sixth. 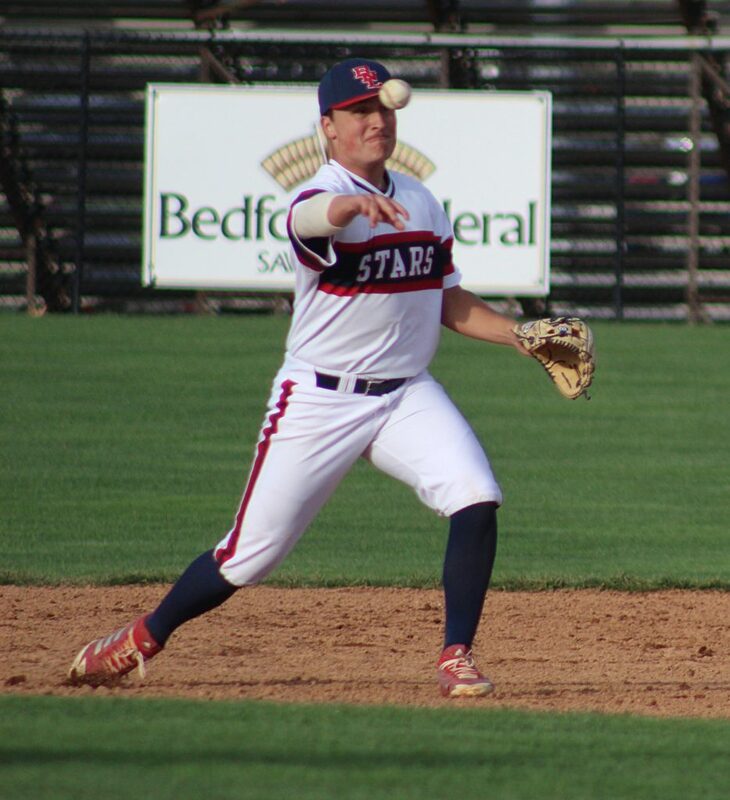 BNL’s Whitt Callahan throws out a runners from his position at second base. The other Brown (1-1) on the mound kept the Cougars quiet, allowing 6 hits and 2 earned runs. Dawson Howell and 3 hits and 2 RBIs for North Harrison (1-6). BNL will return to action on Saturday at Evansville North.